Primula beesiana, is by some authorities now treated as a subspecies of Primula bulleyana, and is one of the species known as candelabra primula. Flower stems grow 50–60 cm high and flower in late spring or early summer. They prefer full sun or partial shade, and are long lived. Primulas are herbaceous or semi-evergreen perennials, forming a basal rosette of simple leaves, with bell-shaped flowers which may be solitary or carried in an umbel or in whorls on an erect stem. Proliferae or Candelabra section primulas are moisture-loving, herbaceous or semi-evergreen perennials forming a rosette of basal leaves, with erect stems each carrying several whorls of salver-shaped flowers. 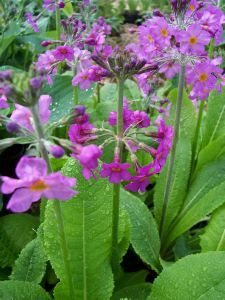 Primula beesiana is a deciduous perennial, forming a flat rosette of light green, crinkly leaves to 20cm long, with erect, mealy stems bearing several whorls of yellow-eyed, purple flowers in late spring and early summer. Uses: Great for damp spots in part shade.